God blessed me with good parents, and I will be forever grateful to Him for that. They were certainly not perfect – they had the same weaknesses and shortcomings, and made many of the same mistakes as other parents. But, I always knew that they loved me. I always knew that they wanted the best for me. And, no matter how much I messed up, I always knew they would never give up on me or abandon me. My parents didn’t treat me and my brother the same because we were different. We had different personalities. We had different interests. We had different skills and abilities. At times, when my mom would make something special for my brother, I would tease her by saying, “You always did love Brian more than me!” I could say that because she and I both knew that it was definitely NOT true! She didn’t love my brother more than me. She and my dad loved us both with the same quality of love – a love that always had our ultimate best interests in mind. There are very few things that I can think of that would be more disheartening than believing that my parents would have favored one of us over the other. And, yet, that is what many Christians believe about God – that He shows favoritism – that He deliberately chooses to extend His love and grace to some of those He created while intentionally withholding it from the rest. While Scripture specifically says in several places that God is fair and impartial, and encourages us to act in like manner toward our fellow man, our traditional understanding of how God deals with mankind would have us believe that He definitely shows favoritism. One of the most often quoted passages in the Bible to support this view is found in Romans 9:10-13 where Paul explains that God “hated” Esau. Later in the chapter, Paul seems to justify God’s prerogative to choose some to be saved and some to be condemned by saying that God is the Potter who has “. . . the right to make out of the same lump of clay some pottery for noble purposes and some for common use.” Then Paul asks, “What if God, choosing to show his wrath and make his power known, bore with great patience the objects of his wrath – prepared for destruction? Don’t these passages clearly imply that God hates and rejects some people – Esau at least – and that He prepares some people for wrath and eternal damnation? To gain a proper understanding of what Paul is intending to say, it is important to look at the context. The common view of this passage is that God has sovereignly chosen some for salvation and others for perdition. But, that is not Paul’s argument here. The passage is, indeed, referring to God’s sovereign purpose in election, but Paul is not referring to election to salvation. Rather, he is referring to God’s election to service of those He has chosen to be His instruments. Paul’s purpose in chapters 9-11 is to show how God is merciful to both Jews and Gentiles, and can justly incorporate Gentiles into His plan. He starts by telling his readers that God’s plan has always been to choose some for service, but not others. God chose Isaac, not Ishmael. He chose Jacob, not Esau. He chose them for a special purpose. But, that choice does not mean that the ones God did not choose are irrevocably rejected and destined for eternal suffering in Hell. It simply means that they were not part of the covenant community that God chose to use to fulfill His promise to Abraham that through him all nations would be blessed. If anyone comes to me and does not hate his father and mother, his wife and children, his brothers and sisters – yes, even his own life – he cannot be my disciple. Jesus obviously did not mean that we should literally “hate” our parents, wives, siblings, and children because that would require us to violate the clear Biblical commands to honor our parents, love our wives and children, and love our neighbors as ourselves. He meant that parental, spousal and brotherly love must take second place to love for Him. 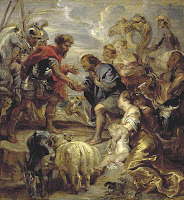 Similarly in the passages in Malachi and Romans, God explains that contrary to the established cultural conventions of the day relating to the inheritance rights of the firstborn son, Esau must take second place to Jacob. Paul’s point is that Scripture foretold that the promise to Abraham would pass through Isaac to Jacob, not Esau. Even though Ishmael and Esau were descendants of Abraham, they were not the chosen instruments through whom God would work to redeem the world. In Romans 9:14-15, Paul asks if God can do this without breaking His promise to Abraham. Is it “unjust” for God to go around cultural conventions to use the descendants of Jacob instead of the descendants of Esau to fulfill His promise? Of course not! God has always been selective. But, His purpose has always been the same – to show mercy and compassion. What then shall we say? Is God unjust? Not at all! For he says to Moses, ‘I will have mercy on whom I have mercy, and I will have compassion on whom I have compassion.’ It does not, therefore, depend on man’s desire or effort, but on God’s mercy. Paul goes on to explain that God made Pharaoh’s heart “firm” in order to proclaim His power and make His name known in all the earth. Then he tells us that God is a Potter who fashions out of the same lump of clay – in this case the natural descendants of Abraham – some vessels for honorable use and some for common use. Ishmael, Esau, and most of the natural descendants of Abraham that made up the Jews of Paul’s day were not chosen to experience the honor of serving as God’s chosen vessels to bring about the fulfillment of His promise to Abraham. That honor went to a remnant of the Jews and the believing Gentiles in accordance with what God has always purposed. But, “common” use does not in any way imply that those vessels are eternally rejected and cursed. They were simply not vessels chosen for that special, “honorable” purpose. All of us also lived among them at one time, gratifying the cravings of our sinful nature and following its desires and thoughts. Like the rest, we were by nature objects of wrath. But because of his great love for us, God, who is rich in mercy, made us alive with Christ even when we were dead in transgressions . . .
Paul himself was once an object of wrath who later became an object of mercy. Assuming that you are now “in Christ,” so were you. And so was I. God has bound all men over to disobedience so that he may have mercy on them all. Who Does God Love . . . Really? Does God love you more than your neighbor? Even worse, does He love your neighbor more than you? No! His love and mercy ultimately extend to all. I find it interesting that a primary premise of Romans is that faith is a condition for salvation, which is an overriding theme in Paul's teaching about election. Also, Paul taught that God's gifts and callings are irrevocable while faith is needed to fully enjoy those gifts. Hmm, Paul appears to place no time limits on accepting God's gifts. True, the sooner the better, but there is no time limit.